I am a pretty homie person. I really like to spend my time at my place. The most obvious reason is because I am so into interior design. I like changing my home decor very often. I am going to show you how to do that without spending lot's of money. You might think that you need a huge budget for decorating your home. Essentially when I pick decors, I follow a couple of guide lines. 1-What do I need in my bedroom? 2-What I am doing in my bedroom? 3-Which colors make me happy? When I decorate my room I always decide on the big picture first. I picked gunmetal for our bed frame which is a charcoal color. Which will be the base since I keep the wall and floor white. 2-Plants: Big green Plants. Adopting plants and adding them to your decor into your room is a simple way to make the room feel timeless. If you are traveling a lot and don’t have the time then you can also get some fresh flowers or just wild greens from the parks nearby. 3- Bed side: I don’t like having these typical bed side pieces. I feel like being put in the same box like everyone else. I am sure everyone has old magazines or books at their place. You can store them right next to your bed. You can also put them to use as a lamp stand or whatever you feel like having next to your bed side. A stool or chair would work great next to your bedside as well. 4- Bed sheets: The most important things in the bedroom are good quality bed sheets. It really makes a great difference. I love my new bed sheet set from Boll & Branch. When selecting them I prefer white or gray tones. Since having my dog snuggling on my bed, I started using shades of gray for my bed sheets. I really like sleeping in organic cotton bed sheets or linen fabrics. Because I spent at least 7-9 hours in my bed over night, I choose good quality sheets from Boll & Branch. 5-Water bottle: I make sure to always have a glass water bottle next to my bed. You don’t need to spend money for a glass bottle. Simply re-use your glass jar or juice bottle. 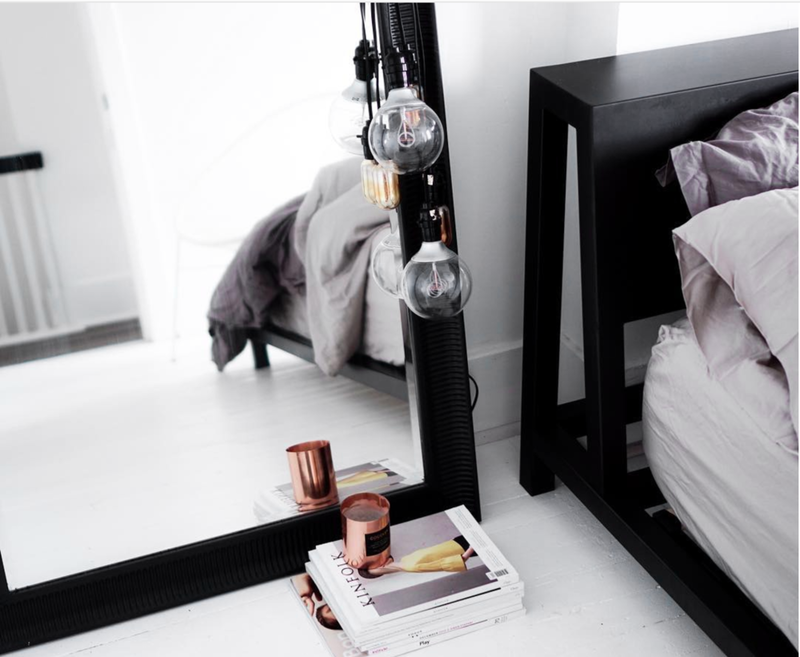 6- Mirror: I like adding mirrors to my bedroom. It's one of my favorite house decors for sure. They are very useful and make your room appear much bigger. 7- Blanket: I always have a blanket laying on my bed. Blankets are very useful decors.